SACRAMENTO – With the April 15 tax filing deadline just around the corner, the California Franchise Tax Board (FTB) is reminding taxpayers to take steps to protect themselves from scam artists seeking to steal refunds and identities. “As Tax Day approaches, scammers are trying to take advantage of vulnerable taxpayers. Everyone should be extra vigilant so they avoid becoming a victim,” stated Controller Betty T. Yee, who chairs the FTB. Scammers often prey on taxpayers by impersonating Internal Revenue Service (IRS) or FTB employees. Through phone calls and email, these fraudsters attempt to trick taxpayers into sending money not owed or providing personal information that may be used to file fraudulent returns and steal refunds. If FTB or IRS staff need to reach a taxpayer to verify a return or discuss a bill, both agencies begin by sending letters via postal mail. If the taxpayer does not respond, the FTB or IRS may next reach out by phone, with courteous agents clearly identifying themselves and never threatening a person. Further, neither agency will demand immediate tax payment over the phone. Any phone call or email requesting passwords or information about credit cards and bank accounts. FTB and IRS agents never ask for these details. If you receive a threatening or fishy phone call, simply hang up. If you receive a letter from FTB or the IRS that appears to be suspicious, contact the FTB at 800.852.5711 or the IRS at 800.829.1040 to verify authenticity. Taxpayers may also check the “Common Notices” webpage at ftb.ca.gov and the Understanding Your IRS Notice or Letter webpage at IRS.gov. Neither FTB nor IRS will send an out-of-the-blue email. Taxpayers are urged to report tax scams and identity theft schemes to FTB as soon as possible, preferably online. The IRS offers a list of common scams and encourages taxpayers to forward phishing scam emails to the IRS at phishing@irs.gov. Sophisticated scammers have also been stealing personal data from tax preparers and businesses. Preparers and business owners who may have been targeted should contact FTB at 916-845-7088 and select option 1. 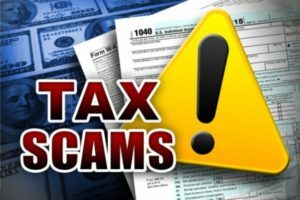 2 comments for "Beware of scams as tax day approaches"
Another scam. Come open your business on the BLVD. Epic fail.